Sometimes, as a teacher, I feel like one of those honeybees who come back to the hive and do a little funky dance that tells the rest of the clan where the nectar is. Lately, I have been browsing the Michigan Quarterly Review’s site where every issue since their first in 1962 has been archived. There’s a whole lot of nectar there. You can read every word of every issue, from Saul Bellow’s essay, “Where Do We Go from Here: The Future of Fiction” in their first issue, to works by Yevtushenko, C. K. Williams, Charles Simic, and Joyce Carol Oates in 1997, or more recent issues, including Winter 2007, with work by Nicholas Delbanco, Charles Baxter, and an interview with Arthur Miller. This site seems to me to be the model for how a print magazine can best offer itself to readers and researchers, i.e. for free, and in celebration of its own inclusive aesthetic. All depends on the skin. All depends on the skin you’re living in. Sekou Sundiata, a poet and performance artist whose work explored slavery, subjugation, and the tension between personal and national identity, especially as they inform the black experience in America, died Wednesday in Valhalla, N.Y. He was 58 and lived in Brooklyn. Mr. Sundiata's art, which defied easy classification, ranged from poems performed in the style of an oral epic to musical, dance and dramatic works infused with jazz, blues, funk, and Afro-Caribbean rhythms. 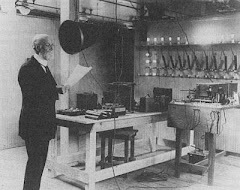 In general, as he once said in a television interview, it entailed "the whole idea of text and noise, cadences and pauses." His work was performed widely throughout the United States and abroad, staged by distinguished organizations like the Brooklyn Academy of Music and the Spoleto Festival U.S.A. Among Mr. Sundiata's most recent works was "the 51st (dream) state," an interlaced tapestry of poetry, music, dance, and videotaped interviews that explores what it means to be an American in the wake of the Sept. 11 terror attacks. Mr. Sundiata was born Robert Franklin Feaster in Harlem on Aug. 22, 1948; he adopted the African name Sekou Sundiata in the late 1960s. He earned a bachelor's degree in English from City College of New York in 1972 and a master's degree in creative writing from the City University of New York in 1979. 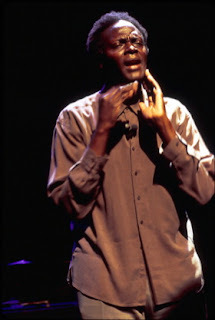 Mr. Sundiata, who performed with the folk rock artist Ani DiFranco as part of her "Rhythm and News" tour in 2001, released several CDs of music and poetry, including "The Blue Oneness of Dreams" and "longstoryshort." 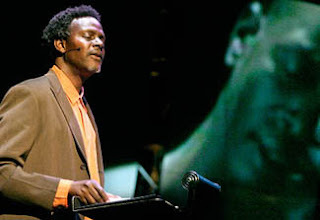 His work was also featured on television, on the HBO series "Def Poetry" and the PBS series "The Language of Life." For a couple of years during my twenties I carried a certain book with me nearly everywhere I went: The Orphic Voice by Elizabeth Sewell. I have no idea how I came to have it (I am an inveterate browser and believer in the serendipity of bookstores, especially sprawling used bookstores, and even then I am always drawn to the piles of books on tables that the staff has not yet had time to shelve) but it seemed to bless me. It seemed to say to me, as I read slowly, often only a paragraph or two at a time, that poetry was as important as I felt it to be, that making poems was tapping into something, a deep knowledge that, with skill, could be accessed, embodied and communicated, and that as a mode of discovery, it was as valuable as its more privileged sibling, science. In fact, that’s not really what Sewell has to say in The Orphic Voice. Tracing the split between Science and Poetry to Francis Bacon, she argues that they are the same inquiry, carried out by the same human consciousness. We are in error if we fall into the “two cultures” trap. She traces that error to the fact that Bacon, as she writes, “was a poet who did not trust poetry.” Early in the book she cites an experiment in which scientists were asked to describe what poets do, and poets to describe what scientists are after. Of course neither recognized itself in the description of the other, although both thrilled to a common description of the work of discovering how the world might be ordered, how that order might be represented, and how that system of representation is itself a process of ordering. 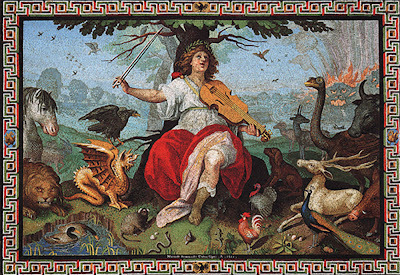 Orpheus sings the creation into a dynamic order. Linnaeus the first taxonomer writes his book in verse. The world is the product of similarities and differences, resemblances, metaphor. So is language, its mirror and mythology. I can only scratch the surface here, and I only mean to recommend the book to anyone who suspects that poetry has an existential, organic function in the workings of consciousness. Interestingly enough, Sewell herself was a political poet, and not only on occasion. She was active in the civil rights movement and wrote a powerful elegy for murdered activists James Chaney, Andrew Goodman and Michael Schwerner. I was an undergraduate at Fordham University when she was there presiding over Bensalem, the Experimental College, founded in 1967, but I had no idea about her at all. Bensalem was in an apartment building across the street from the Rose Hill campus, and I often went there for political meetings or to drink red wine and get high. I was two or three years out of college when I came upon her book, and I don’t think I even made the connection to the bent and somewhat frail woman I sometimes saw on campus. It is of the nature of mind and language together, that they form an instrument capable of an indefinite number of developments. It matters very little whether the particular devisors or users of the instrument saw, at the point in time when they flourished, its full implications. We always say more than we know. This is one of the reasons for language's apparent imprecision. It is no reason for refusing language our confidence. Modern thought supposes that human beings are capable of two sorts of thinking, the logical and the imaginative. We are endowed with the faculties of intellect and imagination — allied, since both are mental, but distinct in their methods and fields of operation. The intellect is the "mind," properly so-called, and its essential function is abstract and logical thought. The imagination is more closely knit with the body (witness its habit, in myth, of expressing all concepts in terms of bodies, of embodying its ideas, in fact, and the close connection of myth with rite or bodily action), and it operates in the more primitive forms of dreams, myth, ritual, and art. Science and poetry, mathematics and words, intellect and imagination, mind and body: they are old, they are perfected and tidy, they are mistaken. If we can dispose of these recurring antitheses which the last 400 years have, with the best of intentions, bequeathed us, we can turn to bequests made on our behalf by other ancestors, for they are there and ready to help. We have given ourselves credit, as human beings, for rather more and rather less than we possess. The human organism, that body which has the gift of thought, does not have the choice of two kinds of thinking. It has only one, in which the organism as a whole is engaged all along the line. There has been no progression in history from one type of thought to another. We are merely learning to use what we have been given, which is all of a piece. This means too that we have to admit and affirm our solidarity with the thinking of the child and the savage. All thinking is of the same kind, and it is this we have to try to understand and to exercise. In its beginnings, language is acknowledged by scholars to have been essentially figurative, imaginative, synthesizing, and mythological rather than analytical and logical. Schelling, for instance, says, “Is it not evident that there is poetry in the actual material formation of languages?” and other writers have said the same. Myth and metaphor, living instruments of a lively speech, are not ornaments and artifices tacked on to language but something in the stuff of language and hence of the mind itself. Language is poetry, and a poem is only the resources of language used to the full. We have come to believe, however, that there is another kind of language, not figurative but literal or logical. It is widely accepted that with advancing civilization comes a progress from imaginative and mythological and poetic turns of speech toward the logical, precise, nonfigurative. Within our own culture, philosophers, logicians, and scientists seem to have striven for this for nearly 400 years, anxious to purify language, in the name of precision, from this very element of unclearness we have glimpsed already, from myth, metaphor, and poetry. Analytical thinking — logic and mathematics, in unison — has been set up as the model to which word-thought was to conform. Recent endeavors to develop languages which are mathematical structures of propositions are the outcome. This is a language-as-science, in its more or less extreme form. The nature of language has been much studied. So has its history. We're after something else: not nature or history but something nearer what we mean by natural history, a dynamic inquiry into process, a natural history of mind and language. Language is to be conceived of not as an entity but as an activity; not in itself, for one must always avoid the metaphor of saying that language is alive, but in conjunction with a mind, with numbers and series of minds in time. Language utterances become events in this kind of thinking. 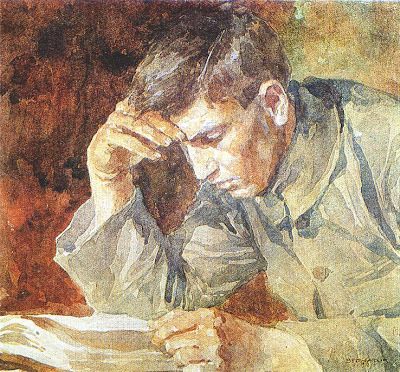 Every poem and recounted myth and scientific hypothesis and theological statement and theory of politics or history and every philosophy become records of happenings at particular times, all of which, if they have any life in them at all, have the capacity to be taken further, in varying degrees, by other minds present and to come. This means giving up the right to abstract language into timeless pattern, and making the effort to grasp it not as a fixed phenomenon but as a moving event, language plus mind, subject to time and process and change — to try to think in biological terms, perhaps. And so. Read The Orphic Voice. Go slowly. Think. Reflect. You may find there an old well-spring satisfying to your thirst. Elizabeth Sewell, internationally known poet, critic, novelist, and friend of Michael Polanyi died January 12, 2001, in Greensboro NC. She was 81. Sewell was born in India in 1919 of English parents and educated in England, taking her B.A. in Modern Languages from Cambridge University in 1942. She performed war service in the Ministry of Education in London from 1942-45, and then returned to Cambridge to complete her M.A. and Ph.D. degrees, also in Modern Languages. Sewell received from her family background and classical education a familiaritywith English literature, history, liturgy, and style that marked her entire life's work. She came to the UnitedStates in 1949, just after completing her graduate work. After many years of trans-Atlantic commuting, she became an American citizen in 1973. Sewell was a visiting writer or professor at many colleges and universities in the United States including, in addition to Fordham, Vassar, Princeton, Bennett, California State, Tugaloo, Central Washington State, Hunter, California at Irvine, Trent, Notre Dame, University of North Carolina at Charlotte, LehighUniversity, Converse College, and University of North Carolina at Greensboro. She received honorarydegrees from many colleges and universities including Fordham University (1968) and the University ofNotre Dame (1984). In addition to the Simon Fellowship at Manchester University (1955-57), Sewell also held the Howard Research Fellowship at Ohio State University (1949-50), and was an Ashley Fellow at Trent University (1979), and a Presidential Scholar at Mercer University (1982). Sewell's major works include criticism —The Structure of Poetry (1951, l963), Paul Valéry: TheMind in the Mirror (1952), The Field of Nonsense (1952), The Orphic Voice: Poetry and Natural History(1960, 1972), and The Human Metaphor (1964); novels —The Dividing of Time (1952), The Singular Hope (1955), Now Bless Thyself (1962), and The Unlooked-For (1995); poetry-Poems, 1947-1961 (1962), Signs and Cities (1968), and Acquist (1984); essays — To Be a True Poem (1979); and a memoir — An Idea(1983). 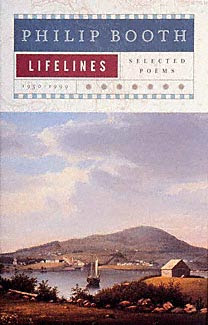 In addition to these volumes, Sewell published dozens of short stories, essays, articles and poems in periodicals in the United States, Canada, England, France, the Netherlands, Switzerland, Austria and Russia. At her death, she left completed manuscripts on William Blake, and on the French reception of Lewis Carroll. Left incomplete was a translation and commentary project on Giordano Bruno and the Renaissance tradition of high magic. Her papers are on deposit with the Department of Special Collections of the Mugar Memorial Library at Boston University. Phil Mullins (mullins@mwsc.edu) has been the editor of Tradition and Discovery since 1991. He tried on more than one occasion to get Elizabeth Sewell to publish something in TAD. David Schenck was a friend of Elizabeth Sewell. He studied with Ruel Tyson and did a dissertation directed by Bill Poteat. And then I checked my email and this poem arrived from Poetry International, a poem that speaks to this very subject (if it is a “subject”) — I told you I believe in serendipity! He has forgotten the words. What strange analogy is man? and turns to his metaphor which is of fire. It is power and walking stick.